All items are saved as layered psd files and are completely customizeable including background, accent, brush, and text colors. All text is included. Thank you Jamie! This is exactly what I've been looking for-now to decide whether I want A or B! Are these sized for printing at WHCC? Also, what size is the tri-fold-5x5? I really love this and I was also wondering if they were sized for WHCC? Also, what are the dimensions of the Thank you card and Product guide? Everything with the exception of the postcards are sized to print through WHCC. The Thank You cards are designed to print as 4x5.5 in. 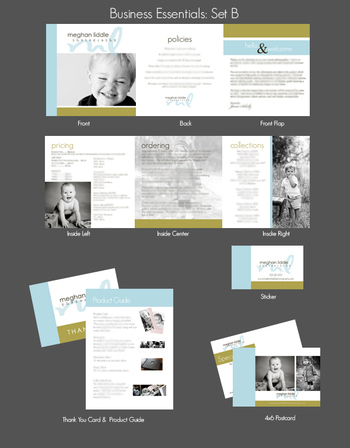 folded cards and the product guide is designed to print as a 5x7 flat card. The postcard is sized as a 4x6 postcard which can be printed through places such as Overnight Print or Got Print. These sets look great. So do you send this out all in one package to your clients? I ask because that's something I would like to do if I purchase the set but am concerned about the different size in the 5x5 trifold and the 5x7 product guide for mailing purposes. Or, do you give the trifold with the booking and the product guide at their session? Sorry for the novel but I'm trying to figure out how to use the set properly. I put all of the information (5x5 tri-fold and the 5x7 product guide) in an Envelopment and give it to my clients at their session. I do provide a link to where you can buy Envelopments and other useful tips with the templates. Let me know if you have any other questions! Thanks! Hi. Very interested in your templates. I LOVE them all. I'm a new user to PS, and currently use PSE 6.0. I've had some problems with other templates and was wondering if you know the compatibility to Photo Shop Elements 6.0? Thanks. I love the set and would like to know where you order the two albums that you offer on the product page, the Accordian Mini-Session Album and the Black Leather 30pg 5x7 Session Album. I love the idea of the accordian style brag book but can't find a nice one to offer my clients. I love these products. I definitive need one set. I would like to know if the font and color can be change. What program will I have to make these changes? It is easy to change the pictures and put the info? Can I add my logo? You'll need Adobe Photoshop to edit the templates. The colors can be changed and you can add your logo. There are detailed instructions on how to enter your images into the templates. Templates purchased from Jamie Schultz Designs are protected by federal copyright and are for individual sale only and may not be re-sold for commercial purposes. All products purchased from Jamie Schultz Designs are not available as wholesale to the trade. Finished cards created using templates from Jamie Schultz Designs may NOT be re-sold to photographers at a wholesale price. Wholesale licenses are available for a fee. Please inquire for details. Publication of the designs beyond your blog or web-site must first be approved by Jamie Schultz Designs. Please note that ALL design elements within the templates may NOT be tranferred for use on other projects. Doing so will result in legal action. Due to the digital nature of the files offered by Jamie Schultz Designs no refunds will be given. Enjoy the templates and I hope they are profitable for you! Jamie Schultz is a featured designer for Mpix.com. Jamie Schultz Designs is a featured designer for Full Color.